The recent volatility in markets has had the media buzzing with negative news of all sorts. Just when the US-China trade dispute was becoming old news, it resurfaced on 29 October when a Bloomberg report said that the US is preparing to slap tariffs on all remaining Chinese imports if talks next month between Presidents Trump and Xi fail to produce results. Earlier in October, markets were also worried about whether the Jamal Kashoggi murder could escalate into potential sanctions on Saudi Arabia which could see oil price spikes up. On top of all of that, the markets are also paying attention to Trump’s ongoing fight with the US Federal Reserve, upcoming mid-term US election, Brexit, and then Italy’s budget battle with the European Commission. Economic conditions are strong for the US, but less inspiring for the global aggregate. Growth is currently accompanied by greater volatilities as companies are facing lofty earnings expectations. Market corrections are common occurrences in any growth cycle. They are simply a way for the market to ‘detox’ so that it can move forward more healthily. October 2018 turned out to be a month rife with market-moving events. Some US companies attempted to guide earnings expectation lower, but the seed for volatility was sowed when the Fed defied Trump but also miscommunicated its policy. After the Fed completed its last FOMC meeting on 26 September, the word “accommodative” was removed from its official statement because the Fed recognises that “inflation remained tepid”. These actions were initially seen as an acknowledgement that monetary policy is no longer accommodative, and in turn led to the interpretation that the Fed could be open to slowing its pace of rate hikes. Weirdly enough, Chairman Jerome Powell then sowed confusion by immediately contradicting the Fed’s statement in saying that the “Fed could raise rates beyond the perceived neutral level of rates”. He also added that the removal of the word “accommodative” should not be misconstrued as signaling any change in policy path. The stream of contradictory Fed messages has created lingering uncertainties for both stock and bond markets alike with longer-term US government bonds leading the first leg down in this bout of volatility. In particular, US government bonds in the 10-20 years maturity and the >20 years maturity declined 2.19% and 4.18% between 28th September and 5th October, respectively. As the stocks rout deepens, government bonds eventually caught more bidding interests and their losses narrowed to 0.68% and 2.2% by 29 October. Leaving aside the Trump-vs-Fed drama, the US earnings season was the other big driver of market volatility. Fearful that analysts have been tired of under-forecasting earnings throughout 2018, many US companies have been proactively trying to manage analysts’ lofty earnings forecasts. What’s the evidence? According to Bloomberg, the number of S&P 500 companies saying that profits will trail analyst estimates outnumbers the number of S&P 500 companies saying otherwise by an astounding ratio of 8-to-1. It’s actually a really good thing that so many S&P 500 companies are proactively guiding analysts’ forecasts lower to more realistic levels. It makes for a healthy and sustainable investing environment. However, this brutal honesty is causing the market to overreact in the short term. 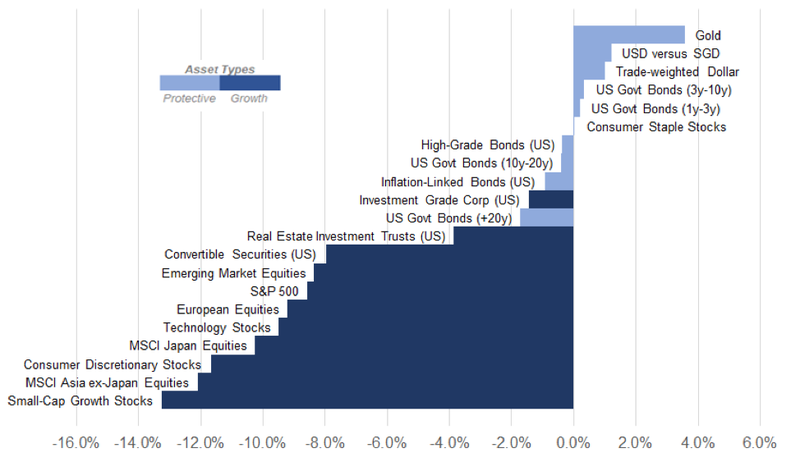 As shown in Figure 1, most growth-oriented assets (dark blue bars) have underperformed in October. The worst performers were small-cap growth stocks, Asia ex-Japan equities, US consumer discretionary stocks and Japanese equities with returns of -13.2%, -12.1%, -11.7% and -10.3%, respectively. This is the first time in a long time that US-based growth assets have underperformed as much as other regions have. One of our favourite leading indicators with a long-dated track record is the Conference Board Leading Economic Index (LEI). The index has been rock-solid and crystal clear that the US economy is strong and steady. More important than the absolute level of the LEI is its rate of change, which provides advanced information on the economy. As can be observed in Figure 2, the LEI has been growing at an annualised rate of 5.9% to 6.4% throughout 2018. The latest print for the month of September (released in mid-October) has accelerated further to 7% YoY. 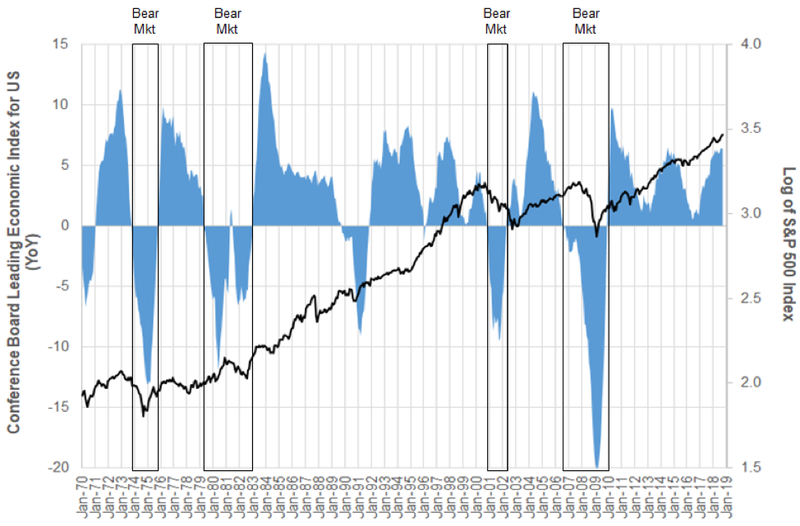 The year-over-year change in the LEI (blue shade in Figure 2) has an excellent track record in identifying major stock market turning points (the logarithm of S&P 500 is shown as the black line). We have highlighted major market doldrums with the rectangles in Figure 2. With the exception of the 1980-82 period in which there were two flip-flops in the signal, year-over-year changes in the LEI were largely able to warn of the impending bear markets. Source: Conference Board, Bloomberg, StashAway. Historically, US and global growth has a high long-term correlation of around 80% (Figure 3) but there has been a notable divergence between the two since September 2017. While the US is doing well, the global aggregate for growth has been weighed down by slowdowns in China and Emerging Markets. The slowing in the rate of growth of these economies are part of the natural ups and downs of an economic cycle and have already started before the trade tension escalated between the US and China. While it’s true that the growth rates of China and Emerging Markets have slowed, these economies are still growing, just at a slower rate than before. Do not misinterpret slower positive growth as a global recession, which is negative growth. For investors, this economic slowdown in China and Emerging Markets means that US-based assets will likely continue to play important risk offsets to other parts of a globally-diversified portfolio. Putting it into another perspective, a portfolio with a sufficient amount of US-based assets has significantly better staying power to invest internationally. Such diversification is key for long-term success. 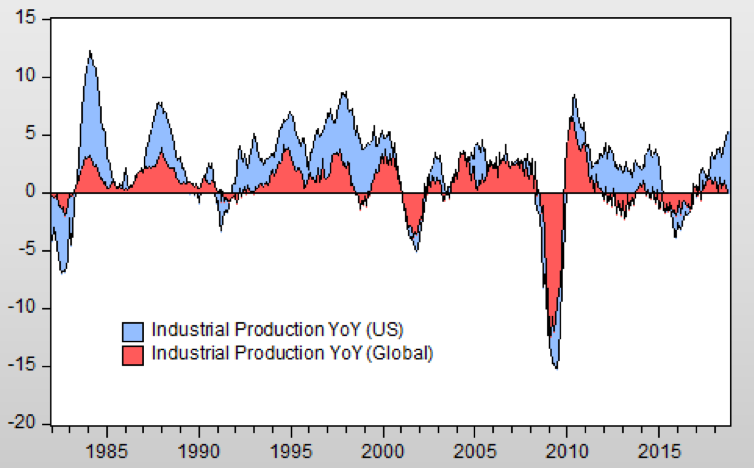 Notes: Growth is proxied by YoY percentage change in the industrial production of a country. The global aggregate is a proprietary index created by StashAway includes countries such as Brazil, China, Denmark, Europe, India, Japan, Mexico, Norway, Poland, Russia, Singapore, South Korea, South Africa, Sweden, Taiwan, Turkey, United Kingdom and the United States. We can’t emphasise enough that it is in the markets’ nature to go through ups and downs over time, even in a strong economy. In other words, a strong economy and market volatility are not mutually exclusive. With strong economic fundamentals, we are certainly not in a bear market, as seen with leading indicators, such as the Conference Board Leading Economic Indices, that have continued to accelerate throughout 2018. Successful investing takes time and patience, and it requires staying true to your long-term investment plan. The last thing you want to do is to exit the markets just because the prices lowered; it’ll hurt you if you watch it rebound later when you have to buy back in at higher prices. Instead, stay invested, diversify and make sure your have the right risk level given your timeline (when will you need the money?) and your risk tolerance (at which point do you lose your sleep? ).